Starting XI for the Champions League final! 🇫🇷 Mister Zinedine Zidane — feeling fabulous at Stadio San Siro. #HalaMadrid — feeling amazing at Stadio San Siro. Celebrate #LaUndecima by adding our special frame to your Facebook profile picture! Sergio Ramos' controversial finish put Zinedine Zidane's side ahead before Atletico striker Antoine Griezmann missed a penalty. 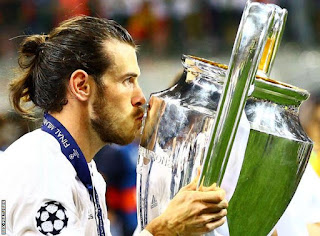 The competition's all-time leading scorer kept his composure to win it - his third individual Champions League triumph following on his from his successes with Manchester United in 2008 and Real in 2014. As stylish as his side were going forward, they were just as impressive at the back as Atletico's attacking duo of Griezmann and Fernando Torres were starved of service before the interval. Bale and Ronaldo repeatedly dropped back into midfield to help cut out the supply routes to Griezmann and Torres, while Karim Benzema also typified Real's work rate by doing his defensive duties. Atletico were the better side after the break yet fortune was on Real's side as Pepe's rash challenge on Torres went unpunished and Stefan Savic stabbed another golden chance wide. Bale was excellent as Real dominated the first half - powerful going forward and quick to help out at the back when required. Yet he still put himself forward for the decisive shootout - and scored with a cool, low finish to help his team to a famous win. Three weeks ago, Atletico were on course for a La Liga and Champions League double, yet Diego Simeone's side end the season without a trophy after the most heartbreaking of defeats. 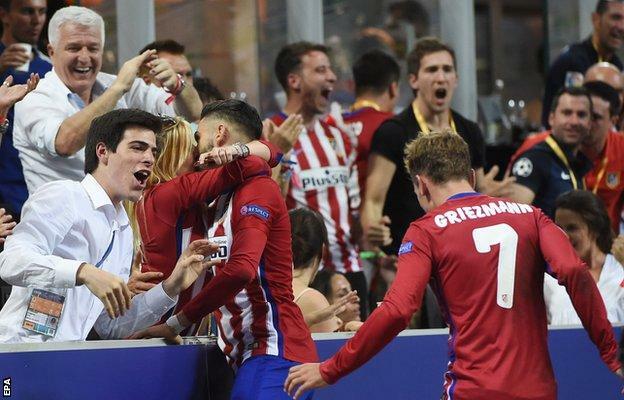 Griezmann became more dangerous but his missed penalty proved crucial, even though Carrasco later levelled after Juanfran's brilliant volleyed cross. England's Mark Clattenburg had his work cut out as he refereed a tempestuous derby, which saw eight bookings. Real defender Pepe was at his theatrical best from the start as he tried to influence the Premier League official, who also had to calm down Simeone after Dani Carvajal's early foul on Griezmann. Ramos put Real ahead from what looked like an offside position but Clattenburg's assistant kept his flag down. 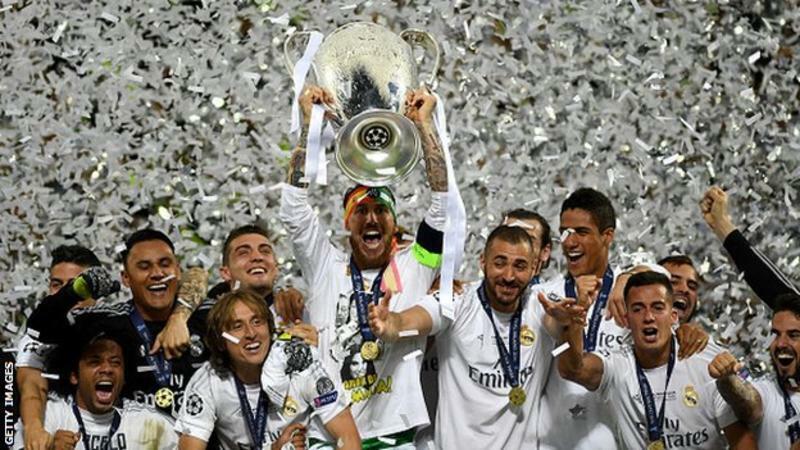 Sergio Ramos became the fifth player to score in two different Champions League finals, and the first defender to do so (also Raul, Samuel Eto'o, Lionel Messi and Cristiano Ronaldo). 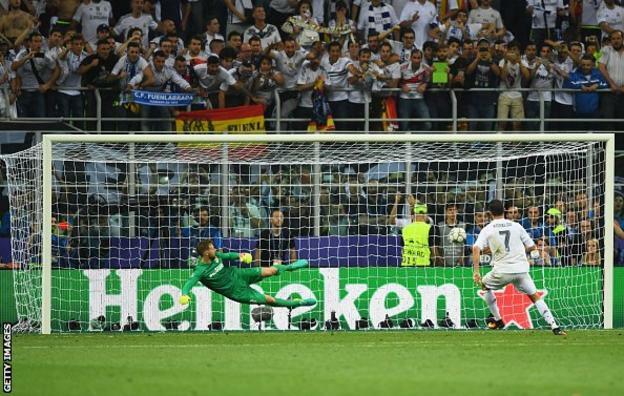 Indeed, Ramos joins Messi and Eto'o as one of three players to score in his first two Champions League finals.